« Thanks for shopping – by bike! @SH_IpsosMORI … Excellent bacon roll and coffee at the @Edinburgh_CC @SpokesLothian bike breakfast. Worth riding up the Mound for. Many pictures were taken, some of which can be clicked in the above tweets. Find more here at flickr.com. You may find more appearing on the Edinburgh Festival of Cycling flickr group. Please tell us of any more Bike Breakfast online photo sets. Edinburgh Bicycle did a massive job on chain-cleaning and ran a £100 prize draw, won by Ian Hall. From Spokes Dave du Feu thanked the breakfast organisers from Spokes and the Council, the stall holders and the many people who had turned up. Sadly there were no centrally-organised feeder rides this year, as coordinator Mike Smith had left – Spokes would welcome a volunteer for next year! He congratulated Edinburgh City Council on sticking to the budget commitment to allocate 5% of transport spending, rising by 1% a year, now 7% in 2014/15, to cycling projects – this is a really big decision, which sets Edinburgh apart from every other Scottish local authority and the Scottish Government. As a result, Edinburgh had attracted considerable additional match-funding from Sustrans, and several big projects were in the pipeline. Main roads into the city – these are the source of the most serious crashes involving cyclists, and are frightening to many. The Active Travel Action Plan includes an action to improve their cycle facilities, yet almost nothing has been done. Furthermore, the actions on such roads should include segregated and/or mandatory facilities. Maintaining a strong central cycling team – the council is increasingly devolving financial and staff resources to local areas and local teams. This makes sense for some purposes (e.g. new drop kerbs) but we are concerned at signs that it may go too far and threaten the strength of the central cycle team. The team is essential to prioritise, design and consult on major schemes, to maintain standards in transport and planning and, essential for the council, to continue raising significant outside match-funds. At National level, the Scottish Government had almost doubled cycling investment for 14/15, up from around 1% of transport spending to nearly 2%, resulting in many new projects throughout Scotland. However, this was still hopelessly insufficient alongside their aim of 10% of all trips to be by bike in 2020. Worse, much of the cash was from ‘windfall’ sources, such as underspending on the next Forth Road Bridge, not a regular cycling budget. It was therefore quite possible that cycling investment would fall back towards 1% in 15/16 and beyond. There is plenty scope above for concerned members of the public to lobby their councillors on local issues and their MSPs on the budget for 15/16 and beyond. A culture-change towards road use and conditions for cycling. Edinburgh’s 20mph proposals were a good step in this direction. Consistent and growing investment in cycling by the Scottish Government, rather than much of the funding being dependent on sporadic windfalls from other budgets. In conclusion, he urged everyone to lobby their MSPs for an adequate, regularised and rising cycle funding in the 15/16 government budgets and beyond. Only with enough support from MSPs would this happen. The Council’s 7% cycling budget. She emphasised that this was not set in stone, but was decided each year by councillors, whose views differ considerably. 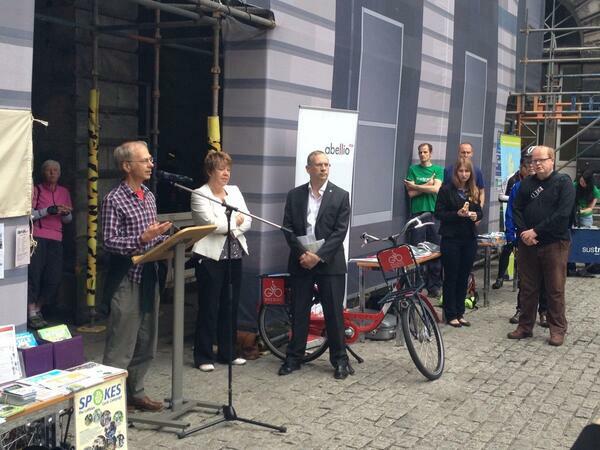 It was up to everyone to ensure that their own councillors understood the value of provision for cycling. The council’s budget also wins big match-funding capital from Sustrans, benefitting the local economy. Finally, like Jim Eadie, Cllr Hinds emphasised the great importance of people contacting their councillors periodically about cycling issues. This helps not just with specific issues, but with maintaining general support amongst councillors, so that they remain positive when budget decisions are made. Cllr Hinds said that although she is happy to receive tweets it was absolutely vital that this did not replace individuals contacting their own councillors. The council will only give a priority to active travel if most councillors understand and support it – otherwise a Transport Convener can achieve much less and the cycling budget itself could be threatened.